Crash! Bang! Splash! Winnie conjures up more magical mayhem in a book of big fun for little readers. Open up for four fantastic stories which crackle and pop with laughter! When Winnie goes into business with her special broomstick-friendly padded pants, will she come down to earth with a bump? Will disaster strike when she flies into action in a local football match against the Boggle-End Rovers? 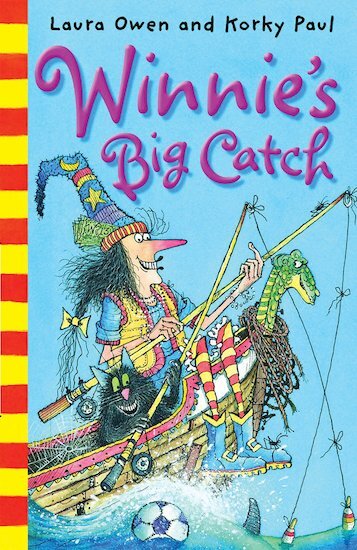 And when Winnie and Wilbur go fishing with Captain Stinky Stan, what mighty surprise will they reel in? Another book of pure magic for developing readers, illustrated in eye-popping style by Korky Paul. Contents: Winnie’s Knickers; Crash, Smash, Winnie! ; Winnie Scores! and Winnie’s Big Catch! From my point of view this is an enjoyable fun questioning what happening next?kind of story when read it to my younger siblings.